This 27 slide PowerPoint teaches children to multiply 2 and 3 digit numbers by a single digit number by using a place value chart and array models. It takes kids step by step through this innovative process that will revolutionize the way your children think of "big" multiplication. 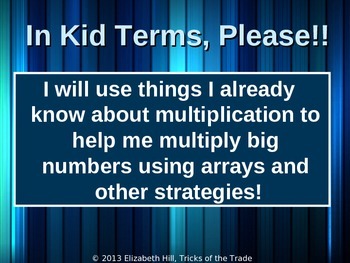 I use this PowerPoint presentation in my classroom as introduction to “big time multiplication”. Then I move into the more traditional array model, and then on to the distributive property. It is great for all students but especially the lower performing students that just cannot master their multiplication facts, because they don’t have to know their facts. It is perfect for accelerating third graders, mastering fourth grade standards, and remediation of fifth graders. It is completely interactive and is meant to be used as an interactive lesson that teachers and students work through together using manipulatives and drawing. 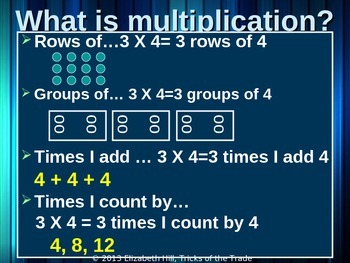 This presentation was created by Elizabeth Hill and has been used in third and fourth grade classes, while bringing amazing results to students mathematical learning.